Why Does My Monitor Stretch and Distort My Display? - Ask Leo! Do all widescreen monitors distort and stretch the image out sideways? If so, I will sell my monitor and get a smaller one, but I suspect a new video card might cure my problem. I can’t seem to get a straight answer from any computer store and I’ve called a bunch. Can you please recommend a video card for me to buy? I have a new low-end Lenovo desktop PC. I don’t do any gaming; I just want a card that can display images on my new 27-inch widescreen monitor at the recommended 1920 x 1080 resolution without the image looking all distorted and stretched out sideways like it does now. My current video card will not support 1920 x 1080 resolution. It’s now set at 1280 x 960. I do have all of the latest drivers installed for both monitor and video card, but that didn’t help. The fact that your video card doesn’t support 1920 x 1080 is the root of the problem here. The issue is something called aspect ratio. The monitor that you mentioned is 1920 x 1080. That gives us an aspect ratio of 1.77. That’s the same as high definition televisions where it’s actually referred to as 16:9. But it’s the same 1.77 aspect ratio. Older video cards often don’t support these resolutions. It’s not necessarily a driver issue, but a hardware one. The hardware has to be capable of driving that higher resolution or even that specific resolution. 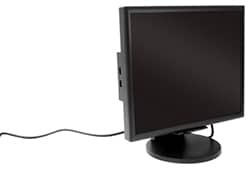 Your monitor maxes out 1280 x 960 which is at an aspect ratio of 1.33, so it stretches the image to fill this screen. And because it’s a different aspect ratio (1.33 instead of 1.77), your monitor it has to stretch it more horizontally than vertically. Thus, the image looks distorted. The solution is to always pick a screen resolution with that matches the preferred resolution of your display. This will ensure that the aspect ratio is also set to match. Ideally, you would pick a larger screen resolution; in your case, 1920 x 1080 might do the trick. Unfortunately, that’s not an option for you. Your next step would be to pick any available resolution from your video card that actually has a 1.77 aspect ratio. One option, 1200 x 720, has a 1.77 aspect ratio that matches your screen. If that’s available, use that. If your video card doesn’t support any resolution that has the matching aspect ratio, then either you end up living with the stretch or as you correctly surmised at the beginning of all this, it’s time to get a new card. I don’t have a specific recommendation for you. The requirements that you might have for video cards will depend on the computer, what it’s capable of, and what you intend to do with it. As you go out looking for a new video card for your machine, look for ones that will support the 1920 x 1080 resolution. Other than that, you simply need to make sure that it is a physically compatible machine and that the interface actually plugs into on the motherboard. It might be time to get a little bit of help from a local technician, but it is not a difficult problem to solve. « Previous post: Will a failing hard drive have warning symptoms? Hi. I have three questions. (1) I’m thinking about buying a 22″ monitor with a native/recommended screen resolution of 1920 x 1080 (1.77 aspect ratio). My Windows 7 PC video card is an AMD Radeon HD 6410D. According to a website, the maximum resolution for this card is 2560 x 1600 (1.6 aspect ratio). However, when I go into Windows, the highest resolution setting available is only 1600 x 1200 (1.33 aspect ratio). Why isn’t 2560 x 1600 available? (2) I have been using a 4:3 monitor with a native resolution of 1280 x 1024 (1.25 aspect ratio), and I have been quite satisfied with its clarity. If on my PC, I go with an adjusted screen resolution of 1600 x 900 to match the aspect ratio (1.77) for the aforementioned new monitor, should the clarity be just as good as — if not better than — what I had been seeing? (3) Is it better from a clarity (and no stretching) standpoint if I get a new monitor in which the resolution AND the aspect ratio matches exactly? For example, I can buy a different monitor (20″) with a native resolution of 1600 x 900, which matches one of the resolution setting offered by my PC. 1) The drivers likely aren’t up to date, or are not the drivers for that specific card. You’d get the drivers from the manufacturer of the video card. 2) Hard to say. Depends much too much on the monitors and video cards involved. Sorry. 3) Forget aspect ratio. The best – sharpest – image comes when the video card outputs the same resolution as is natively supported by the video display. Typically that’s the max resolution supported by the display. Then you use windows settings like DPI and others to make things larger or smaller as needed.